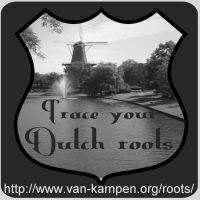 Trace your Dutch roots, a genealogy website by +Henk van Kampen. Groninger Archieven, (Archives of Groningen), is the provincial archive of Groningen and the municipal archive of Groningen City. Address: Postbus 30040, 9700 RM Groningen, The Netherlands. Phone: +31 50 599 2000. E-mail: info@groningerarchieven.nl. Stad & Lande (City and Country) is the historical society for the province and the city Groningen. Many cities, regions, towns and villages have their own historical society. Wie Was Wie, the national database of genealogy records maintained by the Dutch archives and the Central Bureau for Genealogy. AlleGroningers, maintained by the Groningen archives, has indexes and scans of BMD records from the civil register and church books. Internet resources Groningen, an index to the many available online resources for Groningen. Genealogie Groningen, a Groningen genealogy portal site (in Dutch). Genealogie in Groningen, a Groningen genealogy portal site (in Dutch). FamilySearch, the website of the LDS (Mormons) has many Groningen records and scans. Beeldbank Groningen (Image database Groningen), in Dutch. Please note that Dutch graves are usually rented, and reused after the rental period. Headstones and other monuments are destroyed, and human remains removed and often reburied in an anonymous mass grave. Graftombe has indexes of most cemeteries in Groningen. Register to order photos of tombs. Questions, additions, remarks? Share your thoughts in the guestbook, or contact the author.